The clean and well taken care of community, the friendly neighbors, the weather, the amenities, the outdoor recreation, the cultural activities and entertainment, the overall tropical atmosphere and so many other characteristics make Bonita Bay one of the most desirable places to live for countless interested homebuyers. Bonita Bay is truly a paradise for those who choose to settle here and enjoy a comfortable and luxurious lifestyle. Here are some of the top things that make Bonita Bay real estate so desirable. The average temperature in Bonita Bay does not reach higher than 95 in July and no lower than 50 in December and January. Although the area has seen record highs of 98 and record lows of 26, these are not the standard temperatures for this area. The mild temperatures are very enjoyable to local residents who also witness the true tropical nature of the area between June and September with an average rainfall of about eight to nine inches. The refreshing tropical climate allows residents to indulge in various outdoor activities year round. Bonita Bay residents are eligible for membership to the Bonita Bay Club. The club is discreetly tucked within the tropical landscape of the legendary community and is the only private country club in Southwest Florida to boast five championship golf courses, 18 tennis courts and a 10,000 square foot fitness center and spa. The Bonita Bay Club truly allows its members and the local residents to indulge in the finest Bonita Bay lifestyle possible. In addition to the resort-style amenities provided at the club, residents who consider themselves to be boat enthusiasts are also eligible to rent wet or dry storage at the Bonita Bay Marina for their private vessels. The Marina also offers luxurious waterfront dining, private charters and direct access to the Gulf of Mexico. Bonita Bay also offers its own private beach park that sits directly on the Gulf of Mexico with private parking, shower facilities, beach chairs and umbrellas and more. Just outside the community, residents can enjoy world-class dining, unique shopping, various cultural activities and entertainment and so much more. Some of the finest shopping centers in the area include Coconut Point, the Miromar Outlets and The Promenade. There is always something to do in Bonita Bay! The Bonita Bay community is perfectly located near various amenities and outdoor areas, which allow residents to take part in a multitude of outdoor recreation opportunities. There is access to beautiful white sand beaches where residents can enjoy a nice walk on the beach, a relaxing day of sun bathing and swimming, kayaking and many other popular water activities. 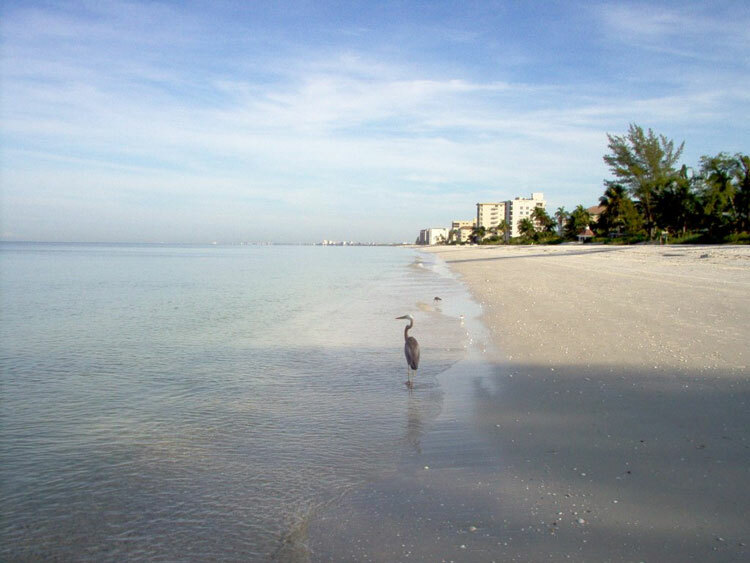 Some of the finest beaches in the area include Lover’s Key State Park, Bonita Beach and Barefoot Beach. If you prefer to stay away from the beach, the Bonita Bay community also offers access to award-winning championship golf courses and tennis courses. The golf and tennis courses are known for setting the standards for land planning and environmental preservation. The intimate Bonita Bay community offers charming neighborhoods with a variety of custom single-family homes, luxurious villas and modern high-rise condo residences that overlook the Gulf of Mexico, the golf courses, the lakes or the stunning nature preserves. The community features more than 1,400 acres of open space including 230 acres of lakes, natural preserves and more than 12 miles of bike trails and walking paths. The 59 separate neighborhoods that make up the luxurious Bonita Bay community create a diverse environment, which has something to offer for every homebuyer and within various price ranges. Whether you are looking for a vacation home or a home to retire to, the Bonita Bay community has something to offer for everyone. The wonderful amenities, beautiful features, natural surroundings, stunning views and friendly people make this community one-of-a-kind and extremely desirable. If you would like to learn more about Bonita Bay and the local lifestyle connect with Dan Humbert and Alberto Quiceno. As local residents as well as expert realtors, they will be the best source of information for anything Bonita Bay related.